Get the inside scoop on the goings on in your favourite soaps this week! This week on Fair City, Jackie is spooked when Deegan tells them the burglar was caught at the scene of another crime, seriously injuring a victim. Realising how close he was to losing Jackie, Hughie pops the question, leaving Jackie stunned. She says yes, but Pete wonders if the wedding will happen at all. Later, Pete and Jackie agree to let go of the past and he gives his blessing to the engagement. Meanwhile, Sash sees Orla’s fear when Wayne tells her the hospital isn’t happy with Junior’s latest blood tests. Sash is relieved to hear Junior is improving but is keen to keep her distance. Feeling even more emotionally blackmailed, Sash finally turns Wayne and Orla down, leaving them devastated. For more, click here. This week on Emmerdale, following last week’s attack, Harriet becomes increasingly terrified by the sinister prank calls she is receiving. When Bob hears Dawn on the phone in the Woolpack corridor, he starts to think she might be behind them and he shares his theory with Harriet. Dawn is furious and says she’s moving out. The next day as Dawn and Harriet reconcile, Harriet is alarmed to receive yet another threatening text message. Later, when Harriet is out in the village, she hears the church bells ringing and goes into investigate. However. she is in for a shock when the heavy church door slams behind her, leaving her locked inside and terrified... For more, click here. This week on Coronation Street, Imran maintains his innocence as the police question him over the stolen H&S report. When questioned about Nick's involvement, Imran becomes suspicious and wonders if Nick is implicated in Wayne's report. Meanwhile, Kate is overcome with emotion when a police officer hands her a bag containing Rana's personal effects. Elsewhere, in the cab office, Dev and Steve conduct a blood pressure competition with Tim adjudicating. Having changed back into his builder's clothes, Gary returns home. Bethany is intrigued and tells Sarah that earlier she saw him wearing a shirt and tie. For more, click here. On Home and Away this week, Bella decides to pack her bag and leave Summer Bay. When Bella gives out to Simone for telling Colby her secrets, Simone is shocked to learn that Bella blames herself for Chelsea leaving. Bella's day takes another emotional hit when she overhears McCarthy talking to Colby about his resignation, asking if Ross got to him badly enough that he needs to leave the force for good, for Colby to admit to him that the reason he's leaving is for Bella – he wants to focus his time and energy on helping her to adjust. For more, click here. On Neighbours this week, Finn sacrifices himself for Susan in a shocking twist. With Finn's hearing approaching, tensions are high and friendships are strained, with Bea particularly angry with how much support Susan is giving him. Ned is also angered by Imogen's quest to get him a non-custodial sentence. Bea goes to visit Finn in the hospital, planning to play him her song Sorry in a bid to make him feel the pain he's having on everyone around him, but when she gets there, a car comes hurtling through the carpark, headed straight for Susan and Imogen. For more, click here. 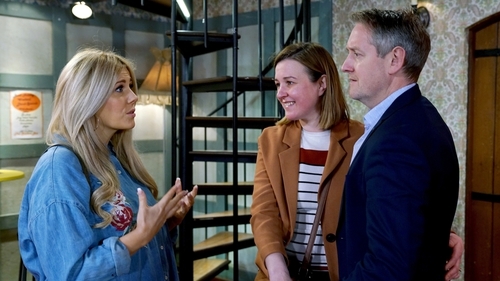 There are plenty of twists and turns involving the residents of Albert Square this week, with Lola and Jay in the thick of things again. Ben arranges a Mitchell family get together, but is fuming when Jay and Keanu arrive - and the day gets worse. First, Phil tells Ben that Jay and Keanu will be working with him, and then Ben thinks Lola and Jay are getting too close and interrupts them in the kitchen. Lola says there is nothing going on, but later she and Jay sneak off to the Vic. Jay makes Lola an offer - and then Ben arrives. For more, click here.